Based on your activity in the system, you can assign tasks to yourself or other users, and other users can assign tasks to you. 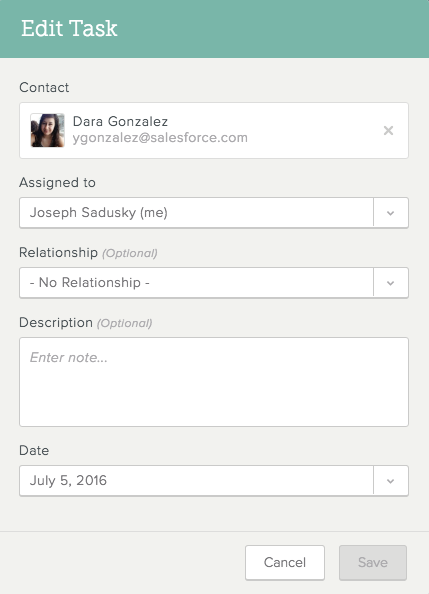 In addition, SalesforceIQ automatically suggests tasks based on your activity in the system. Tasks appear on the Home screen. The sections below cover these topics in detail. Note: Learn about creating and assigning tasks here. All of your tasks appear on your Home screen, whether they are assigned or suggested, overdue (their deadlines have passed), due today, or due in the future. To view task details, click the task. Completed tasks also appear in the Stream view. Mark the task complete—Click . When you mark a task complete, it disappears from the task list. However, completed tasks appear in the Stream. Open the Stream view for the Contact—Click . Email the Contact—Hover over the task and click . Then follow the steps for composing and sending an email. Accept a suggested task—Click Accept. 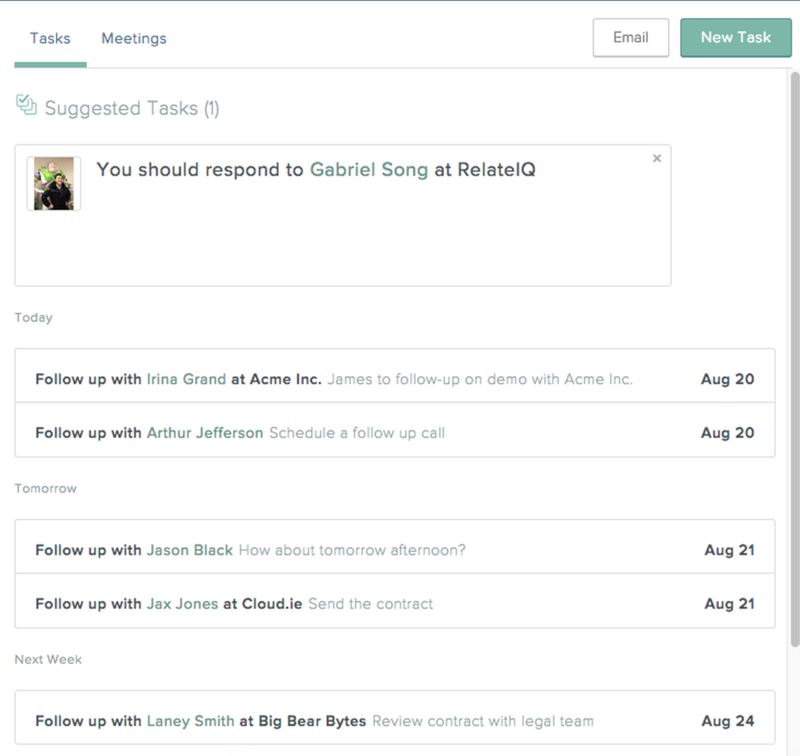 The suggested task moves to your regular task list. Reject a suggested task—Click X in the upper-right corner of the task. You can change task details including the due date. On the Home screen, hover over the task and click . Change the due date or other information. Note: You can also edit task information from within the task. On the Home screen, click the task to open the detail view. Hover over a field and click to edit that field.